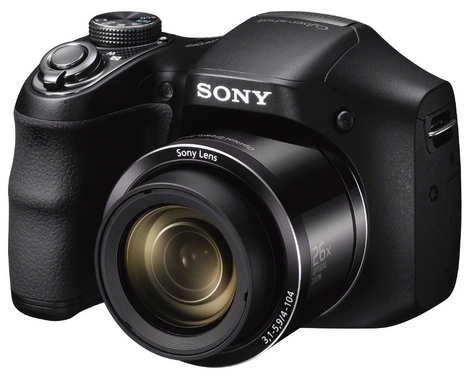 The Sony Cyber Shot H200 is one of the most affordable super-zoom digicams on the market. Its huge zoom lens and great feature set are unfortunately held back by its performance and image quality.. Read more in our Full Conclusion. With versatility and price in mind, Sony created their Cyber-Shot DSC-H200. Their H-series has been known for long-zoom cameras, and the H200 is no exception, With a wide-view, 26x optical zoom lens, there isn't much this camera can't cover. Sony also included a powerful 20.1-megapixel Exmor R CMOS image sensor, improved BIONZ processor, 720p HD video capture, and a plethora of easy to use exposure options; like Intelligent Auto. All this for about $249 USD. The Sony Cyber-shot DSC-H200 is available in black for $249.99 USD. See our lowest price button at the top right of this page to see the most current online pricing.